START: 10:30 – FINISH: 17:30 – DISTANCE: 75 KM – RIDE TIME: 4H 30. I awoke this morning at 7 am to the sound of rain. So I decided the best option was to stay in bed and wait it out. 2 hours later. Not much had changed. So I decided just to go for it. Wasn’t up for getting lost, so I took the most basic route along the coast. Turning right when you get to Belgium. It wasn’t much fun cycling along in the constant rain and I had a lot of time to think about it too, on the very straight and flat roads. Getting closer to Iper I decided to be a little adventurous and take a little detour to Poperinge a town where some of the New Zealanders were stationed during the First World War. 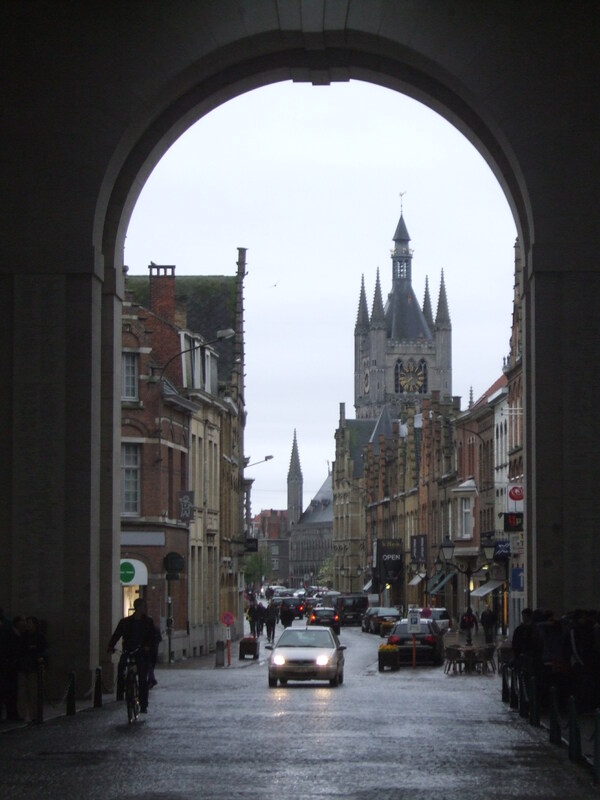 I headed out of Poperinge. After getting directions from the local pub I headed out along the small country lanes. Firstly I paid my respects at Lijssenhook Military cemetery which had the graves of 291 New Zealanders and secondly to Nine Elms British Cemetery which had 117 graves with one of them Ex All Black Captain Sergeant David Gallaher for whom a trophy is played for every time New Zealand play France in rugby. Close to Iper there are more than 150 cemeteries scattered around. Often just in small corners of a farmer’s field. They are immaculately kept by the CWGC. Riding into Iper I again had no idea where I was going to stay. I had hostel on my mind. But with the help of the locals I found a campsite just outside the walls of the city. 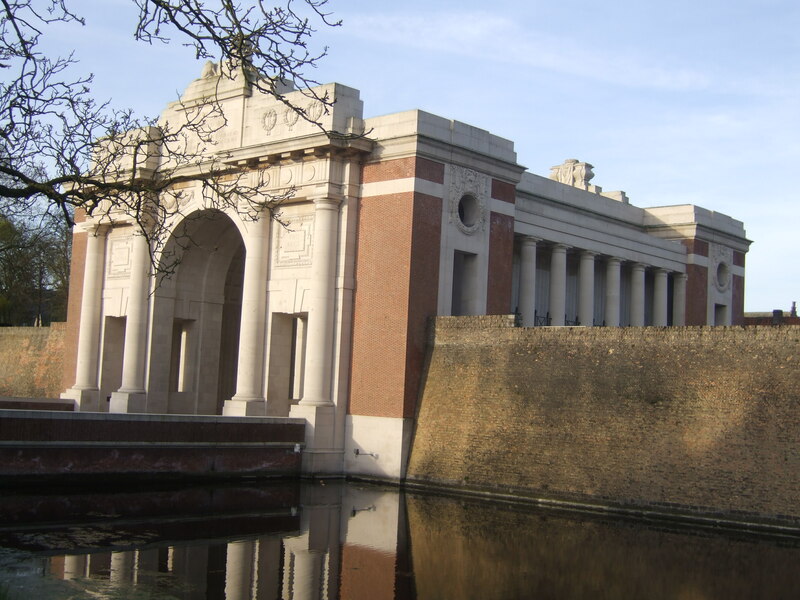 That evening I went back in to the center for the nightly ceremony at the Menin gate Memorial where every day at 8 pm since 24 July 1927 the last post is played and wreaths laid with the only exception being between 1940–1944 due to the Secind World War. 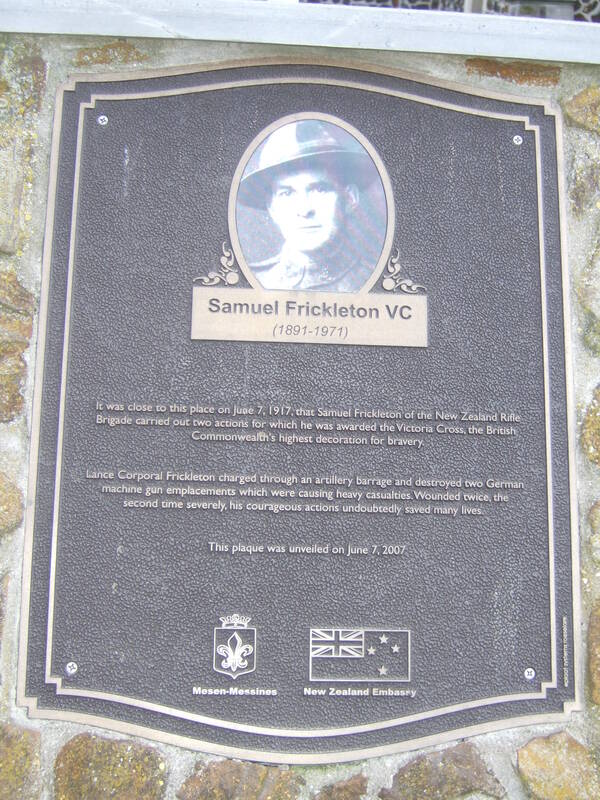 Visiting some of the many Cemeteries and memorials that had a New Zealand connection. 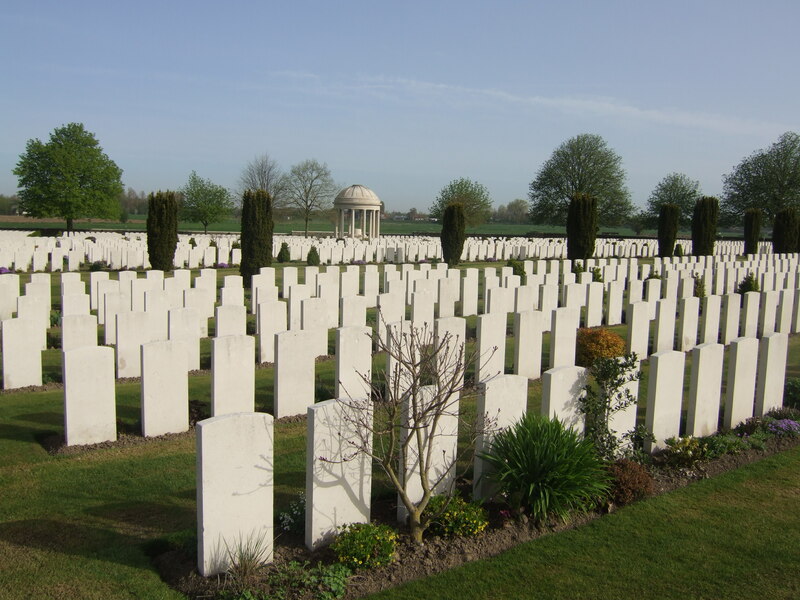 The biggest cemetery was Tyne Cot which had 519 New Zealand graves out 10 000. It is always very moving to think that so many young men never made it home to New Zealand and that their home now is a little corner of Belgium. Got back to Iper in time to visit the famous Cloth hall and the Flanders museum. In the evening I went for a nice walk along the ramparts of the city wall which is moated by water on one side. For dinner I had sausage and chips. Just 10 km from Iper is the town of Messines which was liberated by the New Zealanders in the First World War. It wasn’t a big town. In fact they claim to be Belgium’s smallest town. 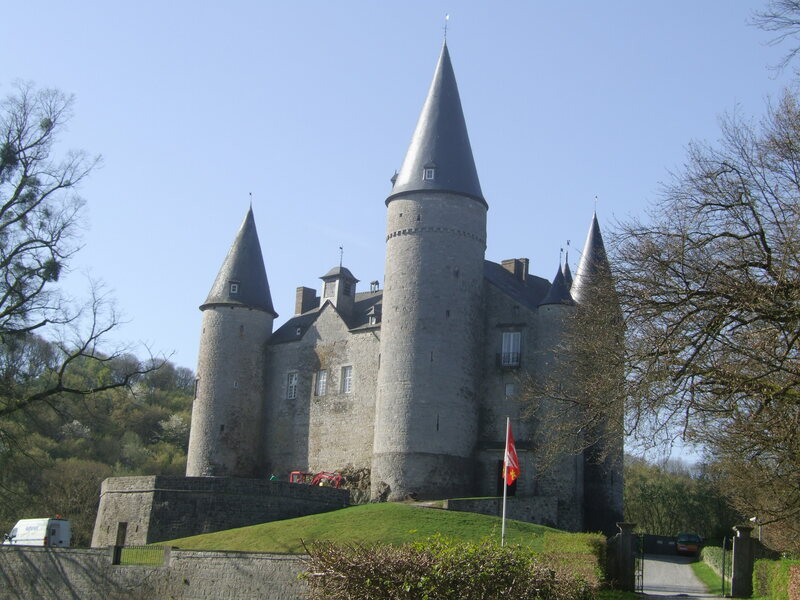 It had a small museum which the town hall kindly opened up for me and was free for New Zealanders. In the Church yard was a memorial to a New Zealand Victoria Cross holder and following Nieuzeelandersstraat to the New Zealand memorial park which over looked the battlefield. From Messines I went down the hill to Ploegsteert wood to where the New Zealand trenches were. These were still visible and having a little wander I came across an old dug out. On the way to the wood I stopped at Mud corner. Here nearly all the graves were those of New Zealanders. In Ploegsteert wood cemeteries the brother of a famous New Zealand writer Catharine Mansfield is buried. Come the end of the day I was feeling very proud to be a New Zealander. START: 7:45 FINNISH: 1:30 DISTANCE: 80 KM RIDE TIME: 4H 20. The roads to Gent were straight and flat and I made good time, stopping just the once in Telt for an early lunch. 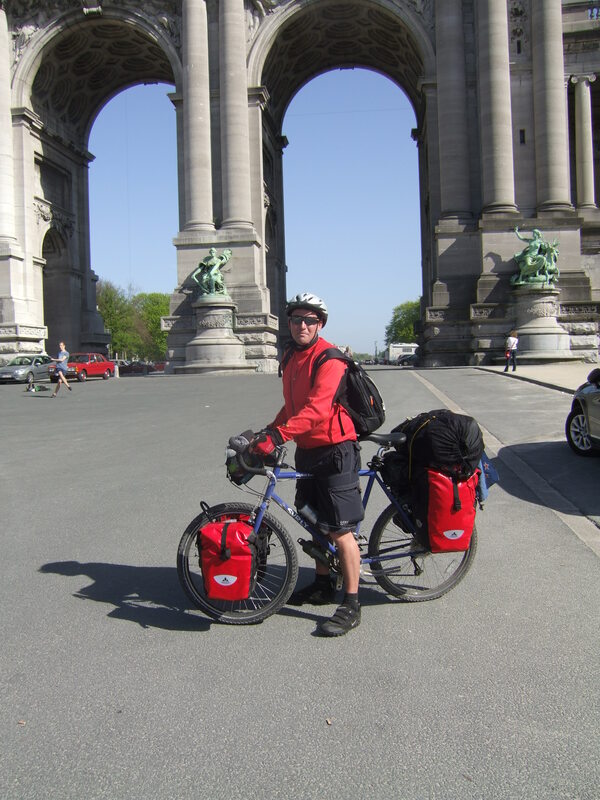 On the way into Gent I was lucky enough to meet Valerie who kindly gave me directions to the campsite. We then arranged to meet up later. After pitching the tent I took myself on a walking tour. The weather was great. Hot and sunny and everyone was down on the river or sitting outside in the squares. It was such a nice atmosphere. 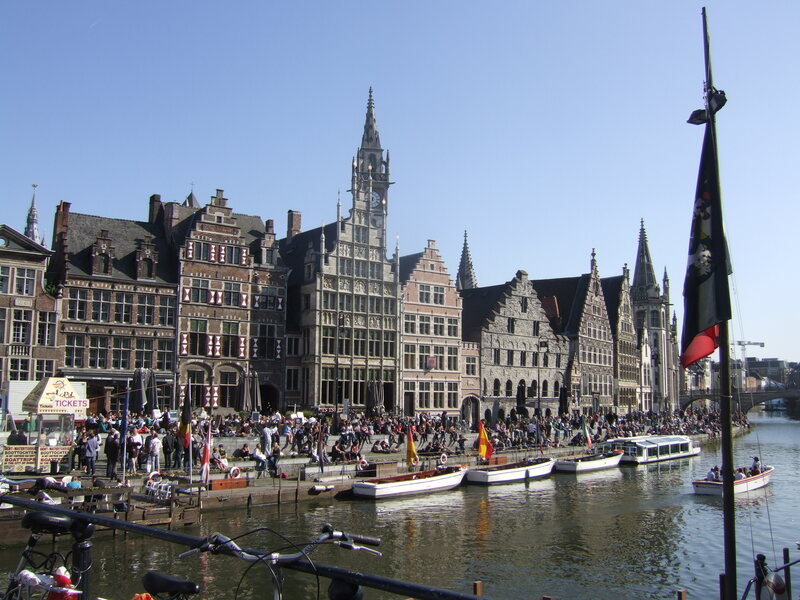 Gent is a very nice old town with the usually cobble stone streets and has three massive churches. That evening Valerie and her friend Veerle collected me from the campsite with their bikes and we headed off into the centre. I let everyone know I was in town with my flashing blue light Charlie had kindly bought for me before my departure and makes you very visible when on the bike. The girls gave me a great walking tour of the old parts of Gent and we then went for a quiet drink. 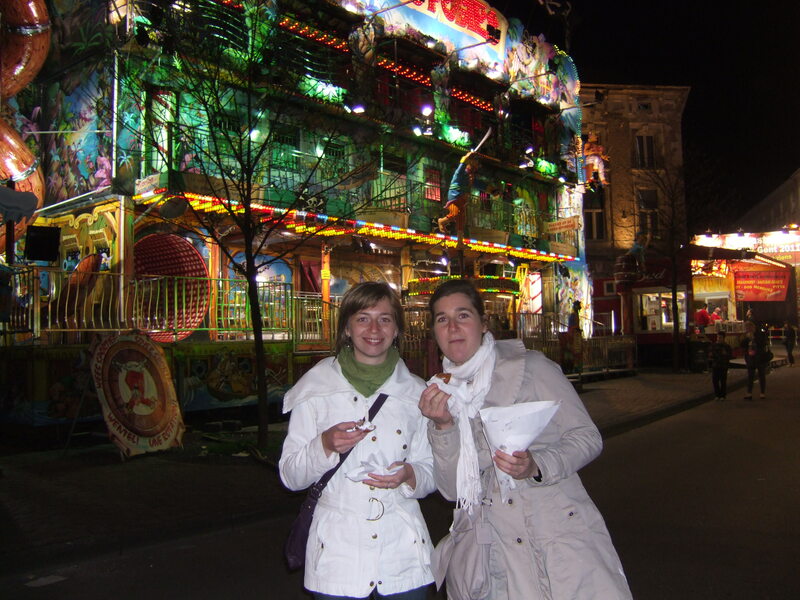 Afterwards we visited the amusement park which had been set up for a few weeks and here we had some oliebollens, which are a bit like doughnuts The last stop was a student pub to get a good insight into the Gent night life. Surprisingly Belgium has not yet banned smoking in pubs. So that was a shock from the past. Finally got back to the campsite at 2 am after a great night out. You can’t beat having the local contact. It’s what really makes a trip like this. START: 9:00 FINISH: 18:45 DISTANCE: 92 KM – RIDE TIME: 6H 30. I spoke to loads of people who were really interested in my trip. Once I found the trail with the kind help of the locals I was on my way first down and then up riding through a lovely forest…….which I thought if worse comes to worse I will camp here. I have no problem stopping and asking for directions fairly often. Even if it is for reassurance I am still heading in the right direction. It’s no fun cycling unnecessary miles. As I was cycling along I had a guy in a van pull over in front of me. He jumped out and just wanted to have a chat. He had done a trip from Morocco to Senegal a few years ago. It’s great the way people will just come up and say hello. When I was getting close to the campsite but had taken a wrong turn. I stopped to ask a couple for directions. He said he had never heard of the campsite but would go and check on his computer for me. While he was doing this I had a lovely lady come and ask me If I would like to camp in her back yard if I wanted. I didn’t hesitate and she said she would check with her husband. I was happy when the answer was yes. Anne and Mare had a large back yard with a pond backing onto farmer’s fields. I was getting spoilt so early on in my trip. I was invited into the house for a shower and Anne made me an omelette and salad which was just what I needed after a long day. 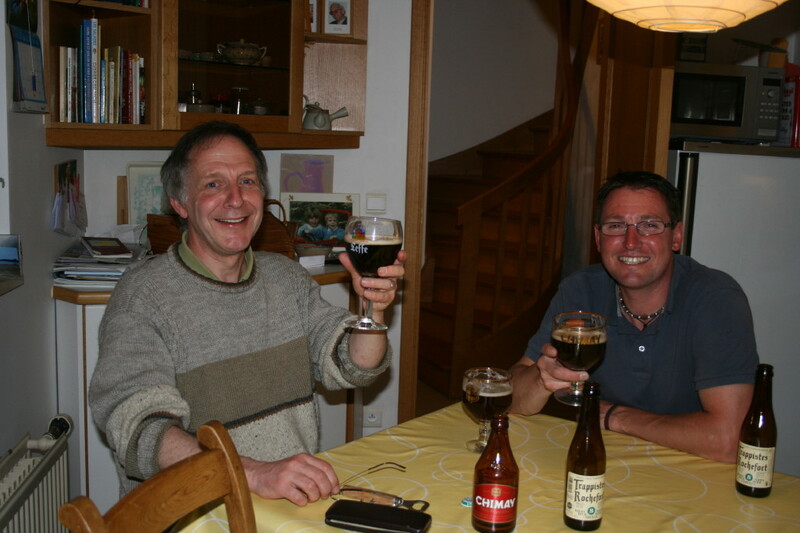 We had a great evening chatting and Mare brought out some special Belgium beers. The type cycling is not recommended after consuming I think they were called Tempest beer and were brewed by the monks. So for two nights in a row I was fortunate to be in the company of locals and having another great experience. The information Mare and Anne gave me in helping me plan out the next few days of my trip was really invincible and I am so thankful. It didn’t end there. In the morning I was treated to a very nice breakfast on their back patio. 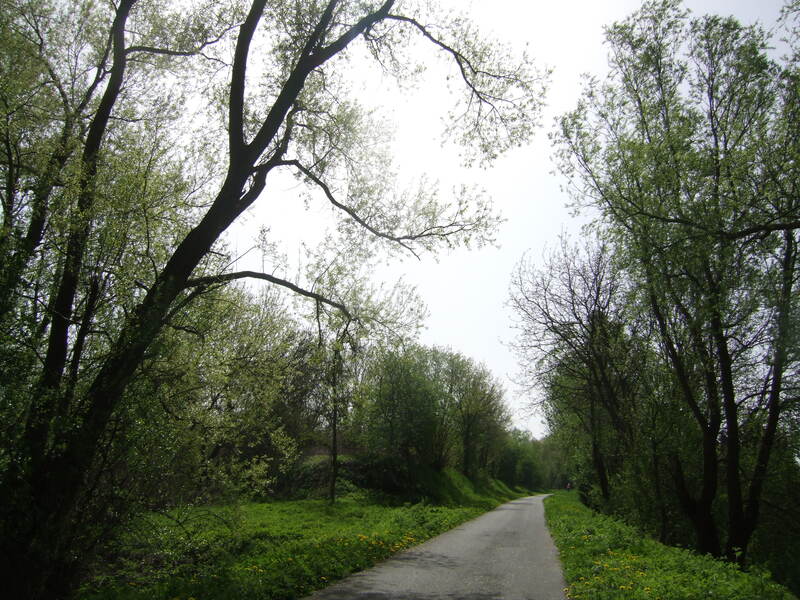 START: 10:15 FINISH: 18:00 DISTANCE: 85 KM RIDE TIME: 5H 30.
that took me a little along the road and through the forest to Hoyat where I picked up the old railway line which took me through the countryside over many rivers. 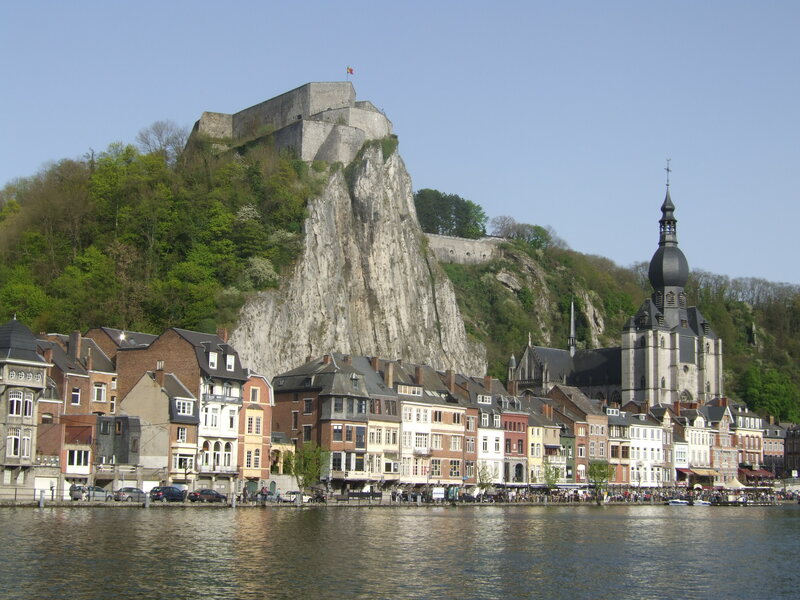 In the late afternoon I reached Dinant which was heaving and looked like a real tourist town with a lot of flash restaurants on the water’s edge and behind the town were massive towering cliffs. I headed about 8 km out of town to the campsite. It was the most expensive at nearly 15 euros a night and you got nothing……having to pay an extra euro for a shower and you needed your own toilet paper. START: 8:30 – FINISH: 15:45 – DISTANCE: 58 KM – RIDE TIME: 4H 45. Left the campsite this morning and the only way was up. Cycled up winding through the forest. Passed two massive chateaus that just seemed to be in the middle of nowhere. Finally had a reprieve from the hills when I picked up the old railway line. Very picturesque crossing lots of rivers and cycling through wooded areas. In the afternoon I started to climb and climb again. It was hot and when I saw the sign for the campsite I didn’t hesitate. I never like to leave it too late in the day to pitch the tent. Like to have a few hours for the tent to dry out because it is always wet when I take it down in the morning. I am glad I stopped yesterday when I did because the first 5 km this morning was through the forest and all up hill. What goes up must come down and the descent winding back down through the forest was a great 15 km downhill run. Come the end of the first hour I had done 21 km a new PB. I like to do a minimum 15 km an hour. Had another good climb to take me into Bastogne. Got in at a good time so I was able to spend the afternoon wandering around. Finally got some internet time. It had been over a week. 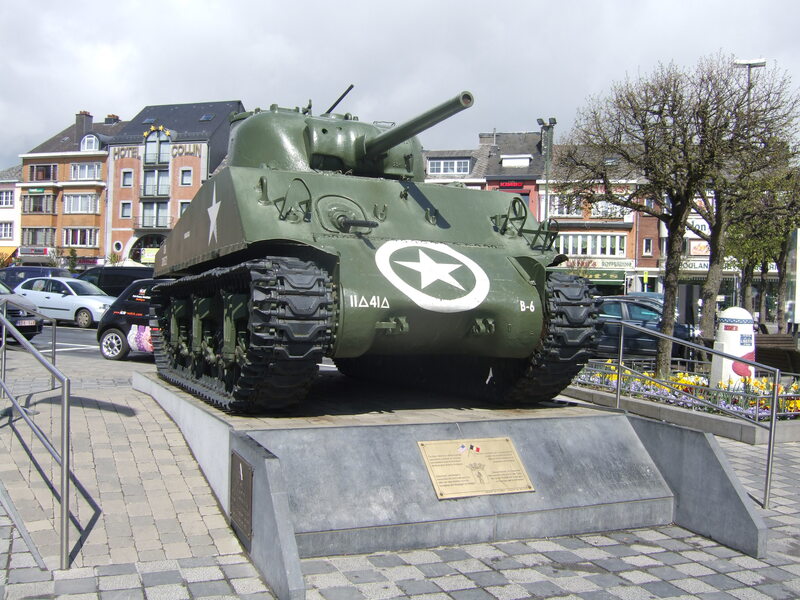 Visited the Battle of the Bulge museum and a few of the memorials from the Second World War. START: 9:00 FINISH: 15:00 – Distance: 75 KM – RIDE TIME: 4H 30. It was another day of ups and downs on the very hilly Ardennes. 12 km down the road I was in Luxembourg. You pretty much need to wear sunglasses all the time to keep the bugs out of your eyes. But the glasses don’t stop you from swallowing them. I have already had my fair share. In the afternoon I picked up the river Saur which was very pleasant to ride along. PS: the tel number you left did not work did u realise?? ?